I started reading his new book, The Case for Gold, this morning. I'm on Chapter 3 already. And the five risks we face in the digital age. In other words, this is not just a book about the yellow metal. It is about our current and coming economic challenges. 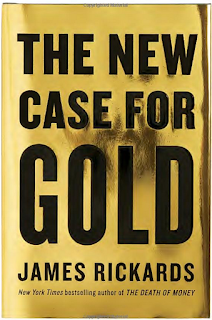 This is my 8th or 9th book on Gold and Monetary Policy, and my third Rickards book. I'll be sharing more on what I've learned sometime in the near future. My February post with links to my precious metals videos and the author's book announcement. Review, DarienTimes (author's home-town paper). Author's article at Market Watch: Gold is the Pile of Poker Chips in the next Global Crisis. For those who've watched my Ratio videos, today's ratio is 81:1. Wow.